Alabama vs. Georgia in Atlanta, this time for the Southeastern Conference championship instead of the national title. It is the earliest the SEC championship game has ever been set. 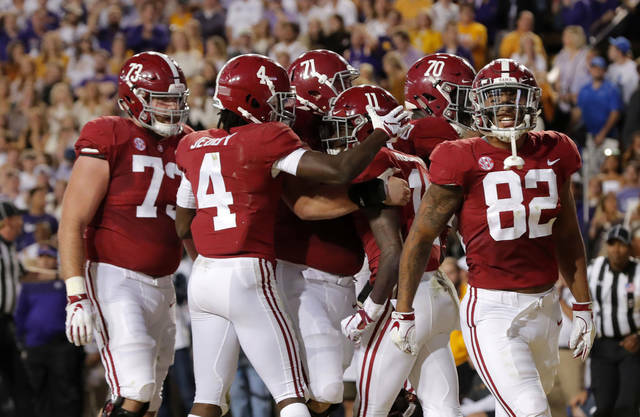 The much-hyped SEC doubleheader that decided both divisions turned out to be a dud: The top-ranked Tide toyed with No. 4 LSU . The sixth-ranked Bulldogs left No. 11 Kentucky in the dust. The Tigers and Wildcats can still go on to good seasons, maybe New Year’s Six bowls, but they were out of their league Saturday. Alabama and Georgia have work to do over the next three weeks to set up one of the most highly anticipated SEC title games ever. It’s hard to fathom the Tide not arriving at the Benz with a 12-0 record. The Tide offense was sometimes slowed but the supposedly vulnerable defense feasted on LSU’s limited offense. Tua Tagovailoa is the Heisman Trophy front runner, but there is a case to be made that Alabama’s best player is defensive tackle Quinnen Williams, who was unblockable against LSU. Georgia is not as safe a bet as Alabama to get through without another loss. And are the Bulldogs really a threat to take down the Tide? Comparing scores can be dicey, but the Bulldogs lost at LSU a month ago. Both Alabama and Georgia can probably afford a loss before they get to Atlanta and still make the College Football Playoff. No doubt Alabama would get in as a 12-1 SEC champion. Georgia, with a victory against ‘Bama, could make a good case as an 11-2 SEC champ. The real question is: If Alabama enters the SEC championship game undefeated does the result even matter for the Tide? A lot would depend on what else happens around the country. Let’s hope the selection committee is not so quick to give Alabama mulligan if it doesn’t win the conference championship. There is little doubt Nick Saban’s team is the best in the country — maybe the best he has ever had — but it’s not as if the Tide has had to run a gantlet of a schedule this season. There will be much complaining in advance about even the possibility that Alabama could make the playoff for a second straight season without winning its conference — which would also likely put two SEC teams in the CFP for the second straight year. Alabama is probably going to make all of that talk moot by stomping everything in its path. No. 2 Clemson may be the closest thing to Alabama right now. No. 5 Michigan is making a case that it is not be that far behind the top two. The Wolverines have one last big hurdle remaining before what would be their first College Football Playoff appearance, and it is an Ohio State team that still looks lost. The Game is three weeks away. Michigan plays at Rutgers next week and has Indiana at home the week after. Then the Wolverines go to the Horseshoe. For the first time since Jim Harbaugh became the head coach in Ann Arbor, Michigan will clearly have the better team when it faces the Buckeyes. Michigan humiliated Penn State in the Big House. 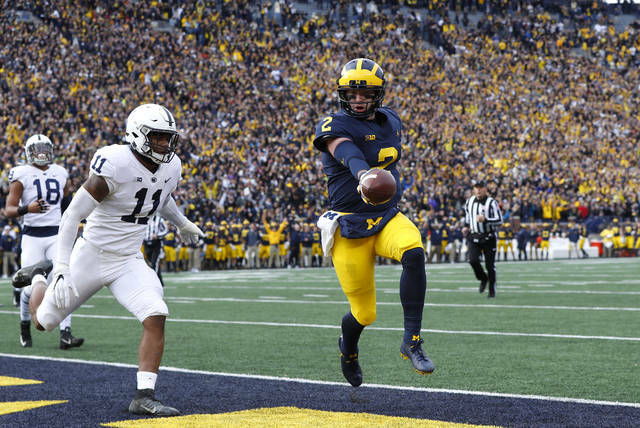 Its defense might be the best in the country and its offense has found an identity behind quarterback Shea Patterson and running back Karan Higdon. The Buckeyes have dominated the rivalry with Michigan for more than a decade, winning 13 out of 14 and all three since Harbaugh took over. But Ohio State in its current state will be hard pressed to keep Michigan out of the Big Ten championship for the first time. The Big Ten West is likely to throw out Northwestern as its representative in Indianapolis. The Wildcats were the last team to come close to beating the Wolverines, jumping out to a 17-0 first-half lead on Sept. 29. Since then, Michigan has outscored the opposition 163-48. It’s not quite the run Clemson has been on since that same day, when it rallied from 23-13 in the fourth quarter against Syracuse. Clemson has outscored its opposition 254-36 since that point. Michigan’s run has come against better competition, though. Dana Holgorsen and No. 12 West Virginia were going for the win all the way on their final drive against No. 15 Texas , and Will Grier converted the winning 2-point conversion to keep the Mountaineers in first-place in the Big 12. Holgorsen rarely gets mentioned as being among the best coaches in college football, and that’s probably fair. He has only won one conference title and that was when West Virginia was still in the Big East. But in some ways Holgo has become a little undervalued during his seven seasons at West Virginia, known as much for his mad-scientist hair and love of Red Bull than being a sharp offensive who fields winning teams without highly ranked recruits. 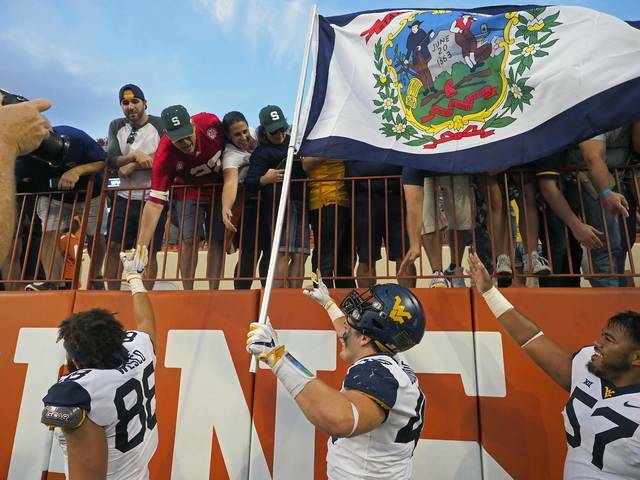 The transition for West Virginia to the Big 12 was no small task. Holgorsen guided the Mountaineers through it with only one losing season. Holgorsen’s overall record is 60-38, and in the Big 12 he is 37-30. There are always rumblings that Holgorsen might be on the lookout for another job and that he and athletic director Shane Lyons don’t exactly see eye-to-eye. Now Holgorsen’s team is a legit playoff contender heading down the stretch, with a home game against No. 7 Oklahoma to finish the season. At this point, Holgorsen is the conference’s coach of the year. Just when you thought the ACC Coastal was the most muddled and mediocre Power Five division — first-place Pitt!— the Pac-12 South stepped up on Saturday, with Arizona State knocking off No. 16 Utah . Arizona, which was 3-5 and looking like a massive disappointed just a few weeks ago, is now tied for first in the division with Utah and USC at 4-3 … Next week’s big game? Try Clemson going to No. 24 Boston College . Clemson can clinch the ACC Atlantic with a victory, but BC would have the inside track to the division title if it can pull the upset. It will be the first time this season ESPN’s “College GameDay” goes to the site of an ACC game … After losing at home to Duke for the first time since 1976, Miami holds the title of most disappointing team in the country. The Hurricanes were No. 8 preseason and if not for a frantic rally against a terrible Florida State team their last victory would be in September against North Carolina. … Navy looks like it is headed toward its worst season since going 2-10 in 2002. The Midshipmen were shutout for the first time since 2012, losing to Cincinnati.